With so much to offer, Asheville is becoming a popular sport for active adults. Asheville is a popular destination for people with diverse interests. The River Arts District is brimming with locally-made arts and crafts, while it has one of the most popular craft beer scenes in the county. 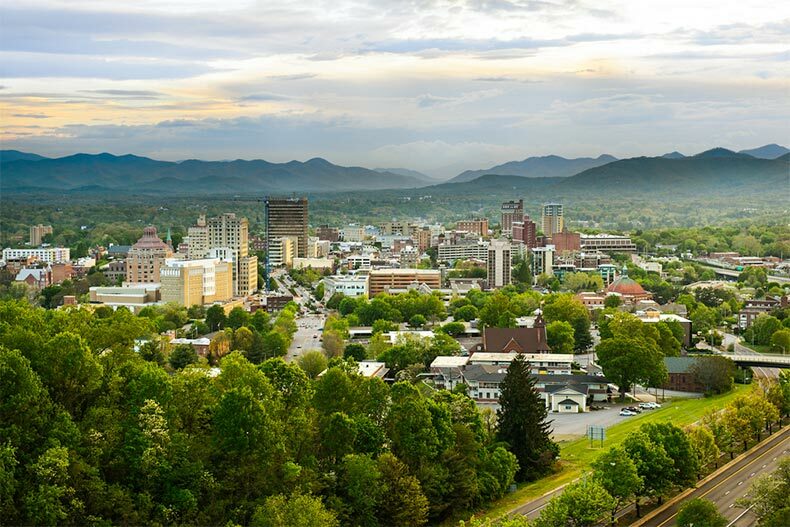 Not to mention, the historic Biltmore Estate is Asheville’s largest tourist attraction, and the Blue Ridge Parkway is one of the most scenic drives in the U.S.
Because Asheville is nestled in the mountains, the city has four seasons. Summers are cooler, with July temperatures averaging around a comfortable 78 degrees. During the fall, the mountains are filled with beautiful browns, reds, yellows, and oranges as Asheville celebrates one of the longest fall foliage seasons in the country. No wonder the region also regularly appears on "best places to retire" lists. The only question is, why wouldn’t you want to move there? If you’re looking for active adult communities in Asheville, look no further. Built around the natural lake of the same name, Biltmore Lake is set on 1,300 acres at the foot of the Blue Ridge Mountains. This master-planned community consists of many different neighborhoods connected by streets, trails, and common areas. With more than 1,000 homesites, there are a variety of floor plans among different home collections. Amenities include the clubhouse, which boasts an idyllic mountain lodge atmosphere with a fireplace, an exchange library, free wireless connection, two tennis courts, and a basketball court outside. In the summertime swimming in Biltmore Lake or relaxing on its sandy beach is always popular. The lake is also available for boating and catch-and-release fishing. Crowfields has 192 low-maintenance, attached homes that range from 1,300 to 3,600 square feet and include two or three bedrooms with two or two-and-a-half bathrooms. The houses in the community are arranged in clusters of four to eight, creating a friendly atmosphere between neighbors. Amenities include an outdoor heated pool, gardening plots, scenic rivers, fishing ponds, parks, a library, an arts and crafts studio, and a clubhouse. With 136 attached homes, Beaverdam Run is situated on 115 acres of mountainside landscape where residents can enjoy nature in a quiet, country-like setting with optional mountain or pond views from their own backyards. Attached homes range in size from 1,800 to 3,600 square feet with two or three bedrooms, two bathrooms, and attached two-car garages. Amenities include a clubhouse with a multi-purpose room and a catering kitchen. There’s also a fitness center and an indoor heated pool along with a sauna. Enjoy being creative in the arts and crafts room or play some pool in the billiards room. Outside, residents can play tennis and pickleball, plant in the gardening plots, and more. The 127 homes in Pinebrook Farms are available in more than a dozen different floor plans and include single-family townhomes and carriage duplex homes. They range from 1,248 to 2,983 square feet and are designed in a distinctive Arts and Crafts style. The clubhouse is the center of the community with billiards, a catering kitchen, an exercise room, and cozy, fireside seating. Other amenities include an outdoor heated swimming pool, walking trails, a trout-fishing stream, and a pavilion.